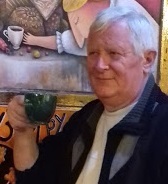 Posted on 27/06/2018 26/08/2018 by Sergei K.
The reason I sit down to write about my Granddad is because he had looked after our family through the most challenging of times overcoming dramatic obstacles that marked the situation in Russia between the years 1920 and 1960. Vassily not only survived but thrived as did his children and their families by the dint of his intelligence and pluck. Vassily attended a primary school run by the parish church and received very good education (I remember Granddad explaining me when I was very young, the principles of four-stroke engine – after more than 50 years he remembered every details). By the time Vassily turned 11, he had already trained as a hammersmith and later while working in the village obtained skills in joinery, carpentry and in caring for horses. In 1913, when Vassily reached 17, he was recruited to one of the reserve regiments of the Tsarist army in Saratov city which was had turned into a regional centre with a large garrison (around 60 thousand service men compared to 242 thousand of townspeople). Due to his experience and expertise, Vassily was appointed in the cavalry regiment. The service of young cavalryman was terminated suddenly in February 1917 when the last Russian Tsar Nikolai II was forced to abdicate. When this was happened, all of Russia experienced a great political shock. The way the course of events of February and October Revolutions unfolded in a province town is very clearly described in the study of Donald J. Raleigh2.For some time, there was total chaos! Within a year the Russian Empire fell with no single political party to take any decision or be responsible for the future of the country: none but the Bolsheviks led by Vladimir Lenin. Why did most of the population within the Russian Empire support the Bolsheviks? The answer to such an important question can be found in the study of Alexander Rabinowitch3. Vassily, a young cavalryman had already served for four years when Tsarist army was disbanded in 1917. He was faced with a choice: to join the White Army and support the previous regime that had been unfair to the majority of people in Russia or to fight for a new and better life promised by Vladimir Lenin and the Bolsheviks in October 1917. My Granddad didn’t think too much of this dramatic situation. Born in poverty and without a chance for a better life if Tsarist regime were to be reinstated and inspired by the new political change and challenges, he signed up for the Red Army and fought in the Civil War that waged between 1918 and 1921. 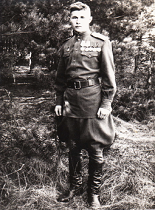 He often told me that this war was largely prompted by Western powers who supported the leaders of White Army. Vassily once again was inducted into the cavalry. 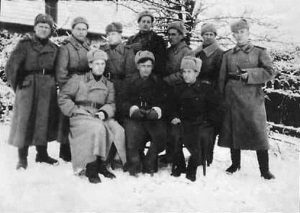 By the end of 1921, all major battles within the Soviet Union were over and the Government decided to reduce the number of military men (till 1920 the strength of the Red Army was over 5 million). 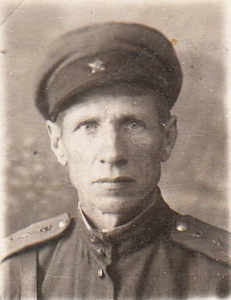 Vassily’s regiment was relocated to Kursk where he met a young woman Evdokia (she was born in 1900)4. ‘The Fate moved the pieces on the Big Chessboard of Life,’ – soon after Vassiliy’s resignation, the young couple married. While researching the lives of Vassily and Evdokia, I applied to the regional archives at Kursk and got lucky when the archivist sent me Evdokia’s genealogical tree. 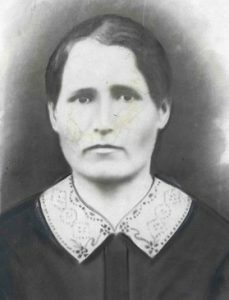 The first record about her family dates to 1675 when her ancestor (surprisingly his name was also Vassily) came to the south of Russia as a “state peasant” – who was different from the “krepostnye krestyane,” a special type of peasants in Tsarists Russia5. Life turned hard in the early Soviet days and my Granddad Vassily, had to employ all his ingenuity to survive. In the period, 1922 to 1930, he with his family had to undertake many travels across southern and western Russia in search of a job. The economy in the country was in deep depression and it was extremely hard to get a reasonable position. The situation was further complicated by crop failures and widespread hunger. 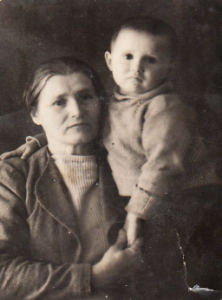 In 1924, their first child Tatyana was born and in 1925, a son, Alexander. In 1929 was born their second son and my father Vladimir. Due to frequent travels of the family Vladimir lived separately with Evdokia’s parents in the Kursk region until 1938. In 1930, my Granddad found a long-term position as a carpenter’s foreman at a coal mine in the Donetsk region6. It offered a good salary that gave him the chance to send his children to the local elementary school and to rent a space for living as well. 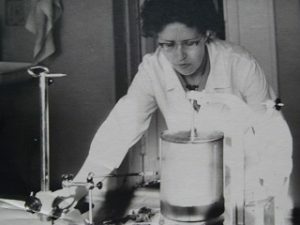 His wife Evdokia also found a job as a cook (she was really a good cook – I do remember this from my childhood). In 1931, Vassily was recommended by the local Bolshevik’s organisation in Donetsk to be a member of the Communist Party and this membership opened up for him new opportunities. The Soviet state had a very sophisticated system of recruiting candidates for different responsible jobs spread all across the large country. Under Stalin, a thorough background check was undertaken before anyone was inducted into the Communist Party and this was repeated at later stages of careers. Upon being accepted into the party, and working for the next 6 years in Donetsk, Vassily in 1937 was sent to an Agricultural College where he earned a Diploma. That year his wife Evdokia and 3 children moved back to live in Kursk. In 1938, Vassily was assigned the responsibility of the Director of a state dairy farm in Tugulym – a small village in Western Siberia close to Tyumen city. He proved to be very successful in this enterprise. Vassily moved the family from Kursk to the new place which wasn’t very easy to travel to (the distance was 2400 km. ), rented a couple of rooms in a two-storey house like shown below, quite typical in Siberian villages. At the end of 1930, Tugulym was a small regional centre where there were a high school, a regional medical centre, a library and the so called ‘House of Culture’-a place where villagers watched performances and movies and organized meetings. Due to its location on the geographical border of Siberia, this village had an informal name, ‘The Gates to Siberia.’ During Tsarist times, large numbers of prisoners had to walk to serve the notorious penal servitude in Siberia. The road they took ran along the outskirts of Tugulym. 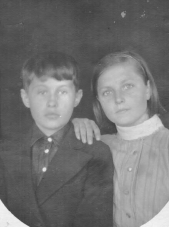 In April 1941, was born their second daughter Raissa and life for Vasily and his family appeared to have become stable till Hitler’s troops invaded Russia on the 22nd of June 1941 and the Second World War came upon our country. In early July, Vassily applied to the regional military recruitment office of the Soviet army and asked to be sent to the front urgently. Such actions were commonly initiated by millions of Soviet people; they were conscious of the need to defend their motherland and the responsibility and honour to do so. In October 1941, after a short training in a course for commanders, Vassily was given the rank of a lieutenant and sent to the north-western front as a cavalry platoon commander. 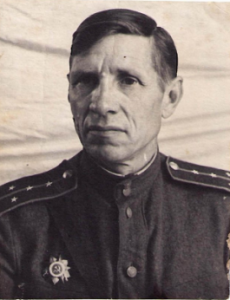 At the beginning of 1944 he was already promoted to the rank of a senior lieutenant with a new appointment – assistant for supplies of 563 mortar regiment in the reserve regiment of the chief command. 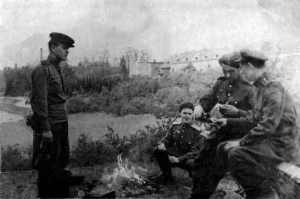 The situation in all the fronts in 1941-1944 for the Red Army was quite dramatic and a lot of young persons in Soviet Union who just reached 18, were to be drafted into the army. This also directly affected my family. In 1942 Vassily’s eldest daughter Tatyana was sent on a short-term course for radio operators and commissioned for war; sadly in 1943 she died in a Nazi attack. 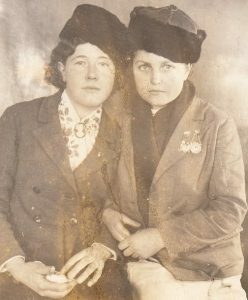 In the photo taken a month before her coming to the war, Tatyana is at the right side with her best friend. The next year 1943 Vassily’s first son Alexander was also recruited and initially sent for training as an aircraft mechanic in school and later to the front. Alexander fought in the war and was granted State awards. The pictures compare how he grew up in War. 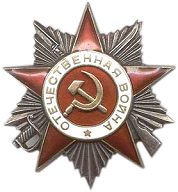 Those who served in the USSR Air Force during the Second World War were known as ‘Stalin’s hawks’. In 2015, I called my uncle Alexander to congratulate him on the occasion of the 70th of Anniversary of the Great Victory.That year he reached 90. Talking to Alexander I suddenly became aware how young he was when the Second World War finished – only 20 years old! The life in the deep Siberian region wasn’t easy. 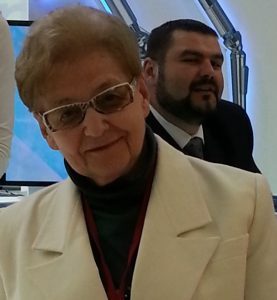 Evdokia worked hard (10-11 hours a day) at a state farm and ran her household. She constantly thought and worried about her children and husband in the war. The second son Vladimir helped Evdokia in housework and took care of his small sister – Raissa. In 1943 Evdokia, sent Vassily a picture of their young 2 year-old daughter. Later in the 60s, aunt Raissa graduated from Medical Academy and became a doctor. She was a radiologist in medicine of high calibre. In May 1944, Vassily was seriously wounded and after treatment relocated to the south-western front. Given his efficiency and adroitness, Vassily was made a captain in the ordnance corps responsible for supplies of soldiers and ammunition. He proved to be excellent in his job and used every trick to keep his regiment contented with all the needs. He put his team to various jobs and that led to some remarkable results7. Using archival sources, I was able to discover episodes unknown to me that demonstrated the talents of Vassily for understanding and assessing people: “…In August 21-27/1944 Vassily K. organized perfectly uninterrupted supply of the regiment with ammunition, armament and food in spite of limited logistic capacities and in conditions of rapid advancement in battle. His actions strengthened combat capabilities for destruction of a Nazi grouping” – written in the “Award list” which I found at the site. For those acts of bravery, Vassily was awarded by the Order of Great Patriotic War of the 2nd grade. It was evident that he was able to get together a cohesive team, using his experience, knowledge and understanding of people. 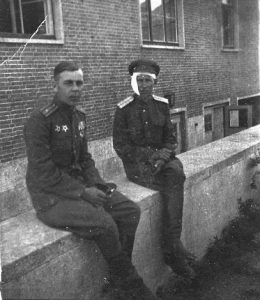 To complete the story of my Granddad in the World War, here are pictures of Vassily with his fellow soldiers and the image of the Order. Returning in December 1945, Vasilly constructed a comfortable home for the family. The battles were over and for the family, three of six members had participated in the Great Patriotic War; the elder daughter Tatyana perished while the others returned safety. For Russia it was just one from millions’ ‘payments’ towards the Great Victory. My father Vladimir also chose to join the armed service. 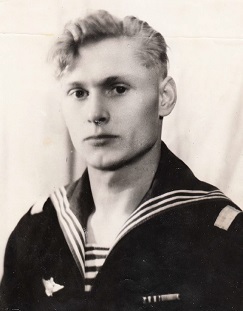 In 1947 after graduating from high school in Tugulym, he was sent to the Naval Aviation College where he obtained the qualification of an Air Force mechanic like his brother Alexander. Forces near Murmansk city. 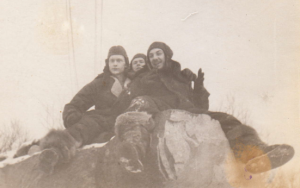 As the member of crew, he flew in hydroplanes for patrolling the Russian sector of Arctic. During the voyages he visited plenty of Polar islands some of which were uninhabited. 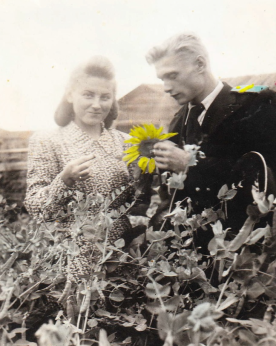 After demobilizing in early 50s Vladimir married, my mother whom he knew from his childhood. Being a small village, Tugulym had a major disadvantage. It lacked any facilities for higher education. 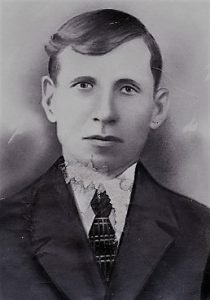 That was why Vassily’s elder son Alexander at the end of 1940s moved to the administrative centre Sverdlovsk (nowadays – Ekaterinburg) and graduated from Ural Polytechnic Academy. He got a Diploma in Electrical Engineering RE-and after some time became an assistant professor at the Academy. Vladimir with the support Alexander also moved to Sverdlovsk, where he was appointed in a factory which manufactured high-tech equipment for space flights. Starting his career as locksmith he reached the level of production site manager. After retiring my Granddad Vassily continued to be very active and engaged in beekeeping, re-modelling of his estate and overseeing livestock. In the middle of the 60s the local administration of Tugulym offered Vassily the job of a carpenter to supervise the construction of a new local canteen for 200 visitors. It was a remarkable event because the village really needed a canteen and the local newspaper published a special report and published a picture of the veterans who participated in construction. All the men in the photograph were local heroes who experienced two Revolutions, the Civil war, the dramatic Stalin’s period, the World War, time of experiments with agriculture undertaken by Nikita Khrushev and a period of Brezhnev’s stagnation. They survived in spite of all the challenges and were yet ready to improve the quality of life in a small village Tugulym, the real rural Russia! I am happy and proud that I got to spend my childhood in Tugulym in my grandparents’ home which I remember very fondly. There I got some lessons like: how to care for livestock and bees (Granddad Vassily was a passionate beekeeper) and to harvest hay, where in the nearest forest could mushrooms or wild berries be found, how to handle a hammer saw, axe and other carpentry tools. From my childhood I have learnt of other “rural” knowledge which may appear a bit exotic in our digital and postindustrial times. My fate, however, decreed that after high school I serve in the Soviet Army and later graduated from Mining Academy and due to the changes in Russia tried various jobs that took me to different countries in Africa, Middle East and South Asia. My Granddad Vasssily and my Grandmother Evdokia died in their home and are buried in the Tugulym cemetery. My parents Vladimir and Eugenia, aunt Raissa and Uncle Alexander have also passed on. Looking at the photos of my heroes, I think: are these not the icons of the beginning of the 20th century? Are their lives not comparable to all the well-known historical figures? Nowadays I am trying to emulate their approach to life, their readiness to respond to challenges and their major characteristic, to take care of family in any changes and conditions of time. All this I hope to pass down to my descendants. Krepostnye krestyane or serfs comprising a large part of Russian peasants, they were actually slaves. It is hard to imagine now but until 1861 (the year of slavery was abolished in Tsarists Russia) the owners of serfs had the power to sell them (even separating from the other members of family), often in exchange for horses and carriages or to use as bails in financial transactions and as card debts. Russian serfs were regarded as property. The ‘state peasants’ had a different status and belonged to the Crown. Sometimes they could be transferred to the property of one of Tsar’s favorite landlords and become “krepostnye krestyane”. Fortunately, neither Vassily’s nor Evdokia’s families were ever serfs. Slavery was a big shame for Russian Empire and it was the major cause why peasants (accounted over 80% of the population in Russia) actively participated in the both of Revolutions during 1917. Their memory of slavery was still fresh! Wonderful story, beautifully written. Thanks for sharing. Salute to your family!